University of Bonn researchers’ idea suggests that if ship hulls were coated with special high-tech air trapping materials ships could save up to 20 percent of fuel as a result of reduced drag. If antifouling effects are also considered the reduction can even be doubled. Of note in the total transport fuel consumption the saving would be worth up to one percent of global CO2 emissions avoided. The aquatic fern Salvinia molesta traps underwater in a thin layer of air, which it can hold for many weeks. Image Credit: © Prof. Dr. Wilhelm Barthlott / University of Bonn. Click image for the largest view. More images available at the press release link above. The team’s study has been published in the journal Philosophical Transactions A. Ships are among the worst fuel guzzlers in the world. All together, they burn an estimated 250 million metric tons per year and emit around one billion tons of carbon dioxide into the air – about the same amount as the whole of Germany emits over the same period. The main reason for this is the high degree of drag between hull and water, which constantly slows the ship down. Depending on the type of ship, drag accounts for up to 90 percent of energy consumption. This also makes it a huge economic factor: After all, fuel consumption is responsible for half of transport costs. Novel high-tech coatings may promise a solution. They are able to hold air for long periods of even weeks. Since then, various working groups have taken up the principle and developed it further. The technology is not yet mature enough for practical use. Nevertheless, the authors forecast a fuel-saving potential of at least five percent in the medium term, but more likely even 20 percent. In their publication in the journal Philosophical Transactions of the British Royal Society, founded by Isaac Newton, they calculated the economic and ecological advantages this would bring. For example, a commercial container ship on its way from Baltimore (USA) to Bremerhaven could reduce its fuel costs by up to $160,000 USD. Worldwide, emissions of the greenhouse gas carbon dioxide would be reduced by a maximum of 130 million tons. 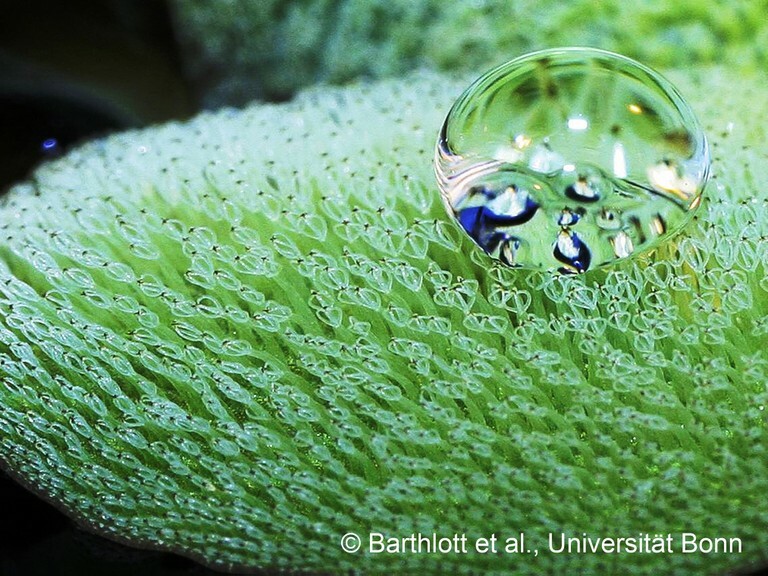 Salvinia has tiny egg-beater-like hairs on the surface of its leaves. These are water-repellent at their base, but hydrophilic at their tip. With these hair-tips, the aquatic fern firmly “pins” a water layer around itself. Its little dress of trapped air kept in place by the water layer. Perhaps this principle will soon cause a sensation in a completely different context: as a potent lubricant for oil tanker and other ship’s hulls. There is huge promise in this work. Folks don’t think a lot about the fuel used transporting the world’s goods at sea. It is quite a large industry. There are some matters of curiosity. Can the researchers actually come up with a coating that works and lasts along with being applied without dry docking the ship? Interested minds want to know.